Yes, we know, Cabo is one of th e top destinations for a beach weddings (if not THE top destination!) Our ocean is teal blue, our Cabo beaches are golden, and the sunsets are truly painted with an artist’s brush! 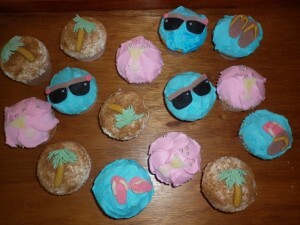 So, we here at Cabo Flowers and Cakes get it, the beach and the ocean are truly inspirations for your event. Cabo Flowers and Cakes specializes in white chocolate and/or milk chocolate shells, that you can use to decorate your wedding cake. (Look closely and see how adorable this cake topper is!) The shells can also be colored (think coral for star fish or just get creative) to match your theme. This wedding cake below showcases some of our white chocolate shells options. 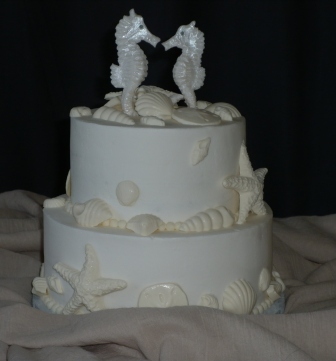 We can also include Bride/Groom sea horses as a cake topper, if that’s what you’d like. 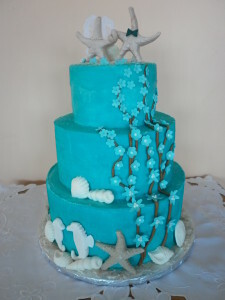 Let Cabo’s beaches inspire you…let Cabo Flowers and Cakes help you create a wedding cake or wedding treat that fits with this ocean theme!